The Act makes education a fundamental right of every child between the ages of 6 and 14. It requires all private schools to reserve 25% of seats to children from poor families (to be reimbursed by the state as part of the public-private partnership plan). It also prohibits all unrecognized schools from practice, and makes provisions for no donation or capitation fees and no interview of the child or parent for admission. The Act also provides that no child shall be held back, expelled, or required to pass a board examination until the completion of elementary education. There is also a provision for special training of school drop-outs to bring them up to par with students of the same age. The Right to Education of persons with disabilities until 18 years of age has also been made a fundamental right. A number of other provisions regarding improvement of school infrastructure, teacher-student ratio and faculty are made in the Act. Monitoring and Implementation of the act should be done by the National Commission for the Protection of Child Rights, an autonomous body together with Commissions to be set up by the states. 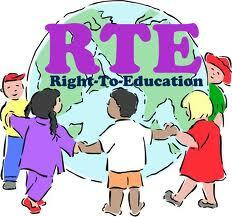 22 July,2011 : The Centre remained firm on implementing Right to Education (RTE) Act without any dilution and told the Supreme Court that even private schools have to keep 25% of its seats for students from weaker and economically disadvantaged sections.Responding to the challenge to the constitutional validity of RTE Act by private schools arguing that it frustrated their fundamental right to trade, attorney general G E Vahanvati said the government had made a provision to reimburse private schools the expenses incurred for admitting such students in 25% of its seats. "If the schools insist on absolute autonomy, the goal of integrated universal elementary education will be compromised," He said the RTE Act was enacted to secure the fundamental right to education of children and steps taken by the government to further their right under Article 21-A of the Constitution could not be construed as stifling the private schools' right to trade under Article 19(1)(g). He said admission given to students from weaker and disadvantaged sections would help build a heterogeneous population of school children across caste, class and gender lines and promote social cohesion. "Learning occurs not merely from instruction imparted within the four walls of the classroom but from the classroom ethos and from interactivity between children from different backgrounds -- different castes, different religions, different socio-economic backgrounds,"